simplecall will help you boost your ability to talk to your loved ones in the UAE with its cheap and affordable rates. We provide an international calling service at a low rate, starting at 17.3¢ /min for landlines and mobiles. And that is not all - we also have a range of features that will make you fall in love with simplecall. This includes a PINless dialling service, an online account and a way to save your favorite numbers so that you can dial them with the press of a button! 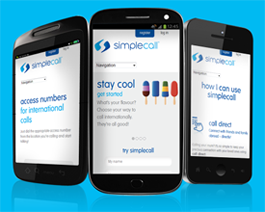 We really like to make things simple for you – that’s the simplecall way! There are many providers who claim to have the cheapest international calls; however, the problem is that most of them offer cheap rates but hide the charges in the small print. This means that in the end, you always end up paying more. At simplecall, we always display our rates on our site and you can access them any time. Plus, with simplecall, the rate that you see is the price that you pay - nothing more! To start using simplecall’s great services, just register with us at www.simplecall.com and sign up for free. In the beginning of the century, the UAE was a group of fishing villages and towns. But in the past few decades, these villages have swiftly developed into a global hotspot for trade and technology, business and commerce. The telecommunication sector in the UAE has progressed tremendously and the area is often viewed as favourable in Western cultures for its liberal stance. Currently, there are nearly 2 million landlines and 12 million mobile phones contracted in the UAE. With its horizon dotted with towering structures, this country is packed with opportunity for everyone and is nothing short of regional superpower.